On Saturday, 8 September 2018, the World Head of the Ahmadiyya Muslim Community, the Fifth Khalifa (Caliph), His Holiness, Hazrat Mirza Masroor Ahmad delivered a landmark address about the world’s immigration crisis and the subsequent rise of the far-right in the Western world before an audience of more than 1,000 dignitaries and guests on the second day of the 43rd Annual Convention (Jalsa Salana)of the Ahmadiyya Muslim Community in Germany. Noting the surge in support for the far-right and nationalism in recent times, His Holiness said that society should not shy away from issues that are leading to division but should seek to tackle root causes that are underpinning such tensions. His Holiness said that wherever there is mass immigration, the authorities should ensure that the rights of the indigenous people are not affected and said that immigrants should seek to enter employment as soon as possible. During his powerful address, His Holiness made various suggestions, based on Islamic teachings, about how to defuse tensions in society amongst the people of different ethnic and religious backgrounds. His Holiness also responded to, and refuted, allegations that Islam is a violent religion and that Muslims are prone to abusing women due to their faith. His Holiness referred to a recent report that immigrants were guilty of high proportion of sexual crimes in Sweden. Further, His Holiness addressed security concerns related to mass immigration and the huge financial undertaking required to re-settle immigrants on a large scale. He said such issues should be directly confronted and debated rationally so that solutions alleviating the fears of existing citizens are formed. His Holiness said that the refugees should consider themselves “indebted” to their host nations and its people and the way to repay the favour is that “they should seek to contribute to the society as soon as possible”, even if the only job they can get is basic labour work. His Holiness also stated that in some cases, immigrants received better benefits than tax-paying citizens, which led to “a natural frustration amongst the public”. In terms of security, His Holiness His Holiness said that safety of the citizens of a country is a ‘paramount objective’ of a government and advised that where there was any suspicion about an immigrant, authorities should monitor them until they were satisfied that they no longer posed a threat. Criticising those who blamed Islam for undermining peace in society and fuelling tension, His Holiness said that “a fair-minded, intelligent and wise person” must look at both sides of the story and not base their impression of Muslims and Islam on hearsay. Thereafter, His Holiness dispelled some of the most common allegations made against Islam. His Holiness referred directly to the Holy Quran and the teachings of the Prophet of Islam (peace be upon him). Concluding his address, the Head of the Ahmadiyya Muslim Community said that all avenues in search of peace had been travelled except one. True peace required a belief that all humanity was united as part of the Creation of God Almighty. 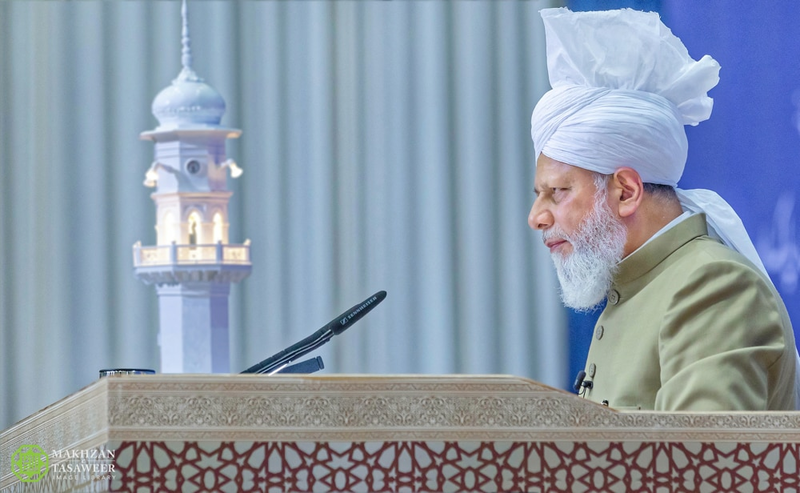 Earlier in the day, His Holiness, Hazrat Mirza Masroor Ahmad directly addressed the members of the Lajna Imaillah(Ladies Auxiliary Organisation) and responded to critics of Islam who claimed that Islam failed to recognise the important role of women in history. On the contrary, His Holiness said that the role of women and the sacrifices they had made for the sake of faith would be recorded in history forevermore. 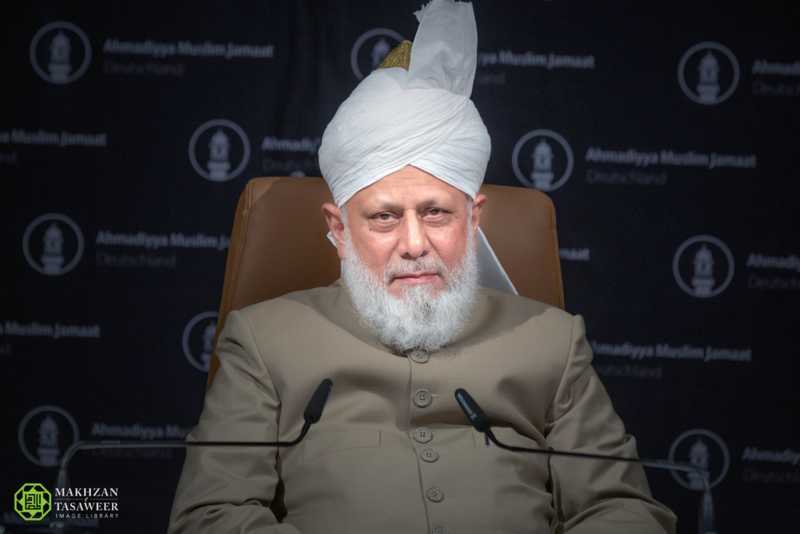 His Holiness also mentioned numerous incidents of great sacrifices made by the early Muslim women in the time of the Prophet of Islam (peace be upon him) and also, in this era, the role and sacrifices made by women from the Ahmadiyya Muslim Community for the sake of Islam. He said they were examples of giving precedence to one’s faith over all worldly matters. After the formal conclusion of the day’s events, His Holiness met with various delegations from abroad, including a large delegation of Arab Ahmadi Muslims and guests.